Poor little business card, your life is pretty hard: as soon as your traveling salesman has panned you out to some apathetic customer you wind up either in the nearest trash can, the doomed pile of business cards next to the telephone, or, if you’re lucky, you earn a seat of honor in the person’s wallet. The latter is fairly rare, so don’t get your hopes up, and it’s amazing to see how many physicians, mechanics, or consultants’ business cards you can amass over a ten year period, and still find them lurking at the back of your wallet. OCR (Optical Character Recognition) technology provides an interesting alternative: it allows you to digitalize your collection of business cards and add them to your contacts. CamCard uses this technology; read on to find out how well. It’s meant to be as simple as Shazam: simply point your Smartphone camera at the business card and within seconds you’ve digitalized all the data onto your Android phone. The question is, does it really work? Well, starting things off is relatively simple. You can decide whether you want to scan an already existing image or else take a picture of a business card. Taking shots works fairly well, provided that there’s enough light. The camera won’t function if it’s too dark, and of course the image shouldn’t be too blurry either, otherwise you won’t get good results. So, keep steady and try to take photos in daylight or with the help of a good artificial light source. It’s at this point that the app’s first drawback becomes apparent: it isn’t possible to use the LED light. Even though not every Android phone comes equipped with LED on the back of the phone, but it would’ve been nice if using it had been an option. By tapping onto one of these fields you can view the text in the same way as it was presented to the character recognition software. You can then double check if the sequence of characters corresponds with the original, and make correction – if necessary – before adding the data to your contacts. 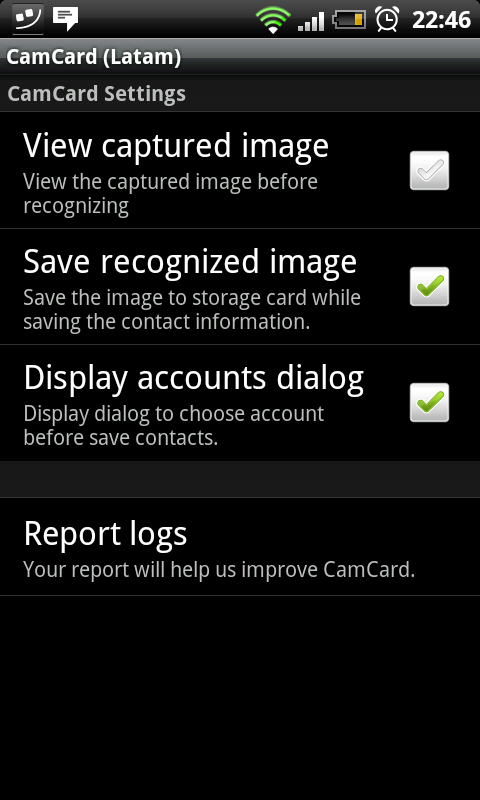 CamCard recognizes whether it’s dealing with a phone number, email address, or other—theoretically. Using Choose Account you decide which group the individual/company should be added to. I also got completely pointless options of viewing News or Weather on my HTC, so I guess I have to meet a groundhog that I can stick into my Weather group. I hope he’ll have some business cards on him. CamCard does a good job of adding contacts to your telephone registry, as well as picking appropriate tags for each one. If a number has been recognized as a fax number it will be listed as such in your telephone directory. The CamCard version tested for this review is only available in English, Spanish, and Portuguese. How good is the lite version? 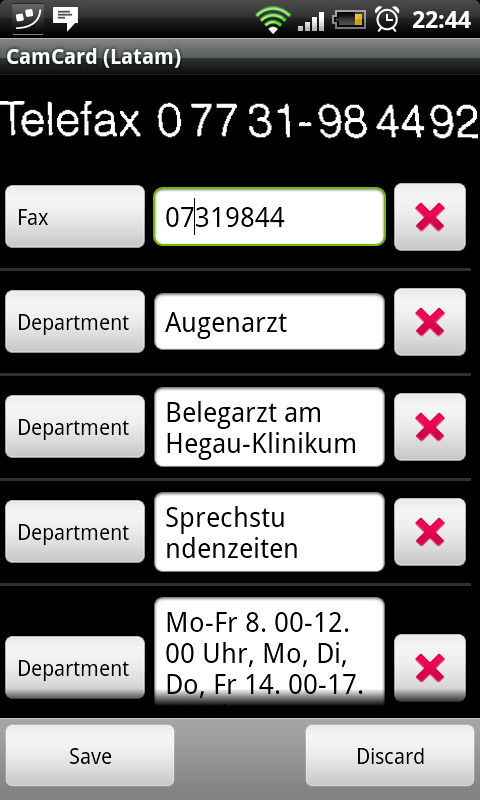 It allows you to scan business cards, but you can only add names and not phone numbers to your directory. Character recognition is contingent on several factors. You need the right sort of lighting, steady hands, and business cards that aren’t too busy. Simple types of fonts and not too many graphics or images guarantee a higher success rate. It’s a real shame about the missing LED option. And for $4,99 it wouldn’t have gone amiss to get a little something extra thrown in: being able to save the business card as an image. CamCard’s design is both outstanding and simple at once. The app is presented as a leather wallet, and it is so easy to use that there’s no need for instructions. The app recognizes business cards in a flash and there were crashes. 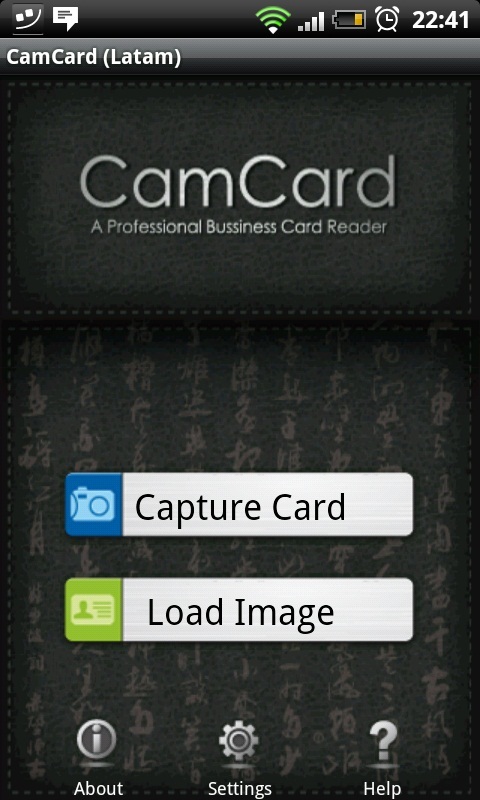 You can download CamCard for $4,99 from the Android Market. Click here in order to download the lite version. Why haven't i got this app.